After doing the research on lawn mowers, I found great reviews being given to the Black & Decker CMM 1200. I didn’t even know there were such things as mowers without the hassle of a cord, but that were also non-gas users as well. 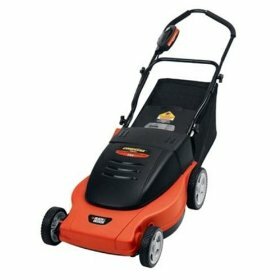 I had been looking for an electric mower as I understood that they have fewer maintenance issues than gas-powered mowers. As I am a woman with no mechanical knowledge, this was a big issue. No gas or oil, no air filter to deal with – great! It is also really easy to start. Just turn the key and lift the lever. The handle folds down for storage in my small shed. The handle is height adjustable, with a cushion-grip – both great features for a small person with carpal tunnel. The mulch feature with rear bag is a great time saver, and also useful for adding to the composter as terrific green matter. The bag is small, so to anyone with a big lawn, this may be a problem, but for me, it only makes the mower more manageable. Don’t be fooled. This mower can handle some pretty dense greenery, and is also not held up if the grass is damp underneath. Now, here is the best part – it comes fully assembled! A huge selling point, to me at least. The only negative is this: the documentation is terrible. I asked a neighbor what he thought as I thought it was my lack of knowledge and experience. He is a mechanic and agreed that the instructions were almost useless. The other thing he mentioned is that no where does it tell you how to change the battery and that I would have to take it to a dealer. All in all, it is a great mower and I really would recommend it. This mower is a piece of junk. It doesn't hold a charge at all. And, takes forever to charge. I have 2 lawns, front and back, and can't even cut both at the same time. I always have to charge half way through the rear lawn. I guess if you have a small lawn, it would be good.